Beau Stoddard (Batinkoff) is a Postal Inspector on the Edge, or PIOTE. A former FBI agent, he now has to work with his ex-co-workers Robert Brickland (Shaw), Jack Forrester (Woodbine), and Jane Dreyer (Berkley) to find a mad bomber (if I may reference the great Chuck Connors film) who has been blowing people up all over the L.A. area. Most people don’t seem to approve of Stoddard’s bad attitude and unorthodox ways, but he gets results that they can’t deny (these days, we pretty much just cut and paste that sentence from our old reviews, with a new name filled in). Will Stoddard find the mad bomber before he explodes again? Will he unravel a conspiracy that goes all the way to the top? Will he do it all before the big hockey match that’s single-handedly supposed to repair U.S.-Russian relations gets blown to kingdom come? Who will press the…DETONATOR? Detonator is a relatively decent example of what you can do if you’re planning on building a feature film around explosion footage from other movies. You won’t get Blown Away (1994) by it, but the cast makes it work the best they can. Evidently, the filmmakers took the blow-ups from Sudden Death (1995), The Glimmer Man (1996), and End of Days (1999), and, like the way cotton candy wraps around its handle while it is being made, fashioned a movie around said blow-ups. 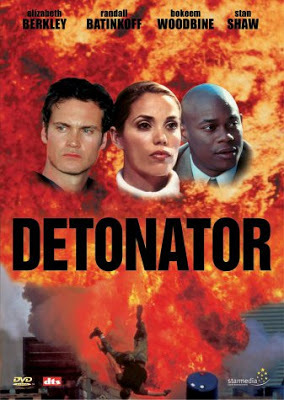 Detonator might not have come onto our radar if it wasn’t for the presence of Elizabeth Berkley in one of the main roles. Like with Showgirls (1995), but to a far lesser degree, it seems she’s still working hard to shed her Saved By The Bell image. However, it doesn’t help matters that co-star Batinkoff looks a lot like Zack Morris. Sorry, Mark-Paul Gosselaar. He even has the same devil-may-care attitude to life that Zack had. So, if nothing else, when and if you should decide to watch Detonator, you can make plenty of Saved By The Bell jokes. We’ve also got on hand Stan Shaw, who seems to be the guy low-budget filmmakers get when they can’t afford Ernie Hudson. This isn’t to denigrate Shaw in any way, as he is a fine actor in his own right, but let’s be realistic here. Bokeem Woodbine has a great voice and does well as Stoddard’s sidekick, and Gregory Scott Cummins has an almost-nothing role and appears primarily as a picture other cast members look at. However, the true standout of the cast has to go to one Will Stewart as Van Wilson, one of Stoddard’s co-workers. He truly steals the show with his Kato Kaelin-like performance*. 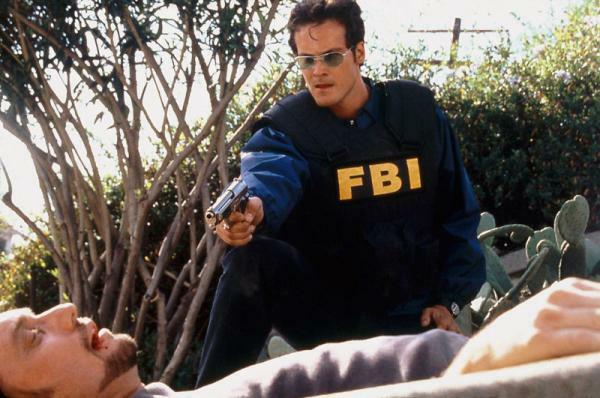 While we give the movie credit for making the lead character a postal inspector, which we thought was different – disregarding fellow postal-inspection movies The Inspectors (1998) and its inexplicable sequel The Inspectors 2: A Shred of Evidence (2000) – in the end, the whole thing is really just more early-2000’s shelf filler. Like many movies of this type, it runs out of steam towards the end. What the movie should’ve been was Batinkoff and Berkley shooting a bunch of terrorists. Or, barring that, shooting a bunch of people who commit mail fraud. We’re surprised this wasn’t a pilot for a syndicated show, because that’s what it seems like it is. Not that that’s necessarily a bad thing – it could’ve been a good show, but, well, such is life. Perhaps the moral of the story is, if you can’t afford your own explosions, maybe make a movie with a different plot? That’s just a suggestion, but, disregarding the fine cast, what we have here really is an exercise in editing. If that interests you, by all means check it out, but others may want to proceed with caution. *We’re willing to bet that’s the first time that sentence has been uttered in human history.